Global climate change has been called the single most significant threat to human existence. 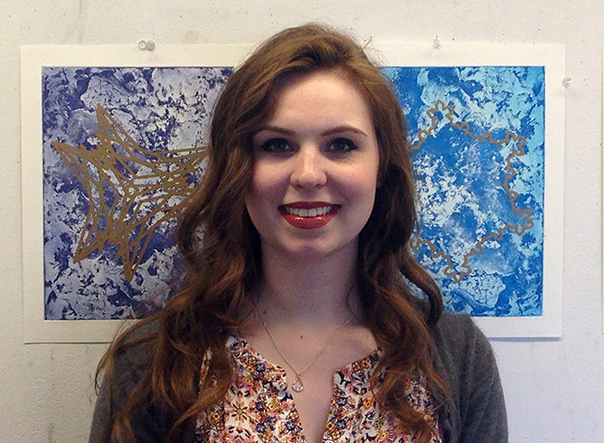 Drake senior Marie Dolleman found a way to make it hauntingly beautiful. Using a combination of her three majors, mathematics, computer science and painting, Dolleman created a single art project, one which exhibits the carbon emissions of eight countries around the world. The project is as remarkable for its scientific rigor and painstaking process—involving complex math, high heat, an acid bath, and a robot—as for its artistry. The project consists of nine pieces of paper lined in a row, eight countries and the control. The colors on each piece progress, from the first page to the last, green to purple, with green representing places on Earth that are more climate-friendly. The carbon-eroded plate used to stamp the ink onto the paper gives each piece a gaseous look, meaning the colors, such as kelly green or aqua blue, are darker in certain places. Then, drawn on each piece of paper, is an infinitely repeating pattern. Each piece of paper has a different pattern as the lines and angles illustrate the carbon emissions data of the country it represents. 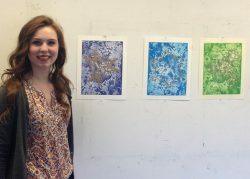 Drake senior Marie Dolleman displays three of nine pieces that comprise her artwork. Dolleman used complex process, including robots, computer programs, and an acid bath to visually represent climate change data. 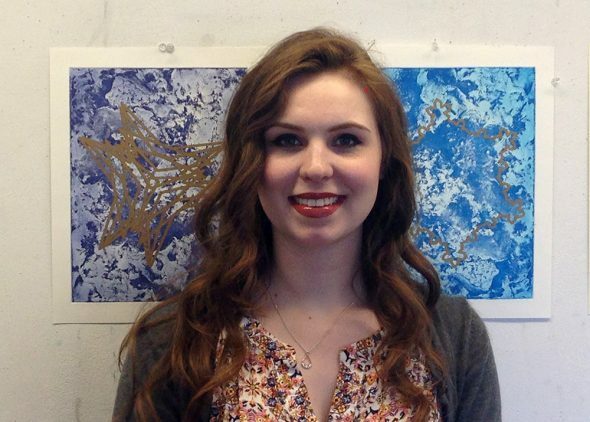 Her work is on display in the Senior B.F.A. Show in The Anderson Gallery starting May 1. Phillip Chen, Drake University’s Ellis and Nelle Levitt Distinguished Professor of Art and Design, was impressed with the aesthetic of Dolleman’s piece and how it is predicated on hard science, mathematics and research methodologies. Dolleman chose eight countries to showcase in her project: Uganda, Bhutan, Tunisia, Costa Rica, Malaysia, the Netherlands, Australia and the United States. She picked them by geographical location crossed with the income of each country, as well as personal significance. Using carbon emissions data, Dolleman inserted the numbers into a formula, calculating lines and angles specific to each country. It was a time-consuming process for the Des Moines native, especially since she did all the math by hand. Then, using a computer script she programmed herself, Dolleman transformed the lines and angles calculated into the shapes found on each part of project, called fractals, which are infinitely repeating patterns. She then used a robot called an AxiDraw to create the same shapes on paper. “I calculated all of the angles, wrote the code to draw the fractals on my computer and then sent that image to the AxiDraw, and the AxiDraw drew it,” Dolleman explained. Assistant Professor of Mathematics Chris Porter suggested Dolleman try the AxiDraw because of Dolleman’s interest in topology, the study of geometric properties and spatial relations unaffected by the continuous change of shape or size of figures. The AxiDraw is commonly used in topology, and it filled a role that traditional laser printers could not because of the materials Dolleman used in her process. In a sophisticated process, Dolleman used a zinc plate, carbon particles, 500 degrees of heat and acid to give the project its gaseous background, all of which adds to the creation of topography. Bronze, silver and gold Sharpie permanent markers were used to draw the shapes, each representing the income of the country. “Data presented in an artistic way presents an opening for important discussion about the data itself and why it’s important to study the numeric value,” said Dolleman. Dolleman’s piece will be displayed in the B.F.A. Show starting May 1 at the Anderson Gallery.